A self-taught artist, he worked as a sign maker and a designer of advertising posters. 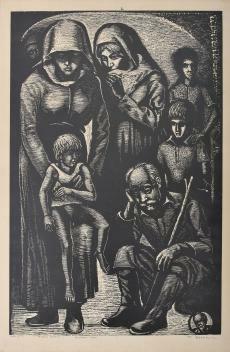 He was influenced by the art of A. Diamantis and T. Kanthos, who also taught him the technique of woodcut. His work was of a realistic manner and his themes included landscapes, scenes from daily life and portraits. He focused on the technique of woodcut. After 1974 he created a series of pieces that were inspired by the tragedy that the Cypriot people experienced. In the late 1960s and early 1970s he experimented with a more abstract style of art; he painted only a few pieces in this style, all of which are characterized by a poetic atmosphere.